Flux Technicolor by Ian Woo. Images with the kind permission of the artist. Flux brings to mind “continuous change” or “the action or process of flowing or flowing out”. Imagine the beginning, a blank primed, pristine white canvas. Setup like a stage, colours straddle upon it like players on a stage, taking their places slowly in different scenes and acts. Stage light is cast in numerous configurations; some light the plants and flowers in a dazzling array of harmonious colours, like fireworks or lighting cue of a pop/rock concert. Where light is absent, they draw the stage into a deep, mysterious abyss. Embroiled within each canvas, are seemingly endless combinations of colours, mixed from four principal colours, and the use of white. The change on each stage/canvas is different, superseded by an untiring impossible landscape, and a near impossible to describe floating mass/object. Only when the impossible has taken shape in hours, days or months, it is given a name, an anchor to which description and forming can begin. Take the above, The Curtain (2009) as an example. The fragmentation in this painting is obvious, deriding the need to succumb to content or subject matter. Containing instead, an emotional vividness and urgency like Wassily Kandinsky, or Jazz improvisation, two bold master strokes come bearing down on the surface – the yellow swoon, and the black veil (the curtain) that occupy the centre of the painting. Plant-like motifs pop up at the bottom fringe of the picture, along with twine-like, and drip-like marks that inhabit the stage. In an explosion of life, the curtains reveal nothing but “recognizable squiggles, dabs and washes form an eruption of pure brush marks”. But what is evident in this painting, and others, is a distinct sense of near and far – a stage or amphitheatre. This is possible with the plant motifs that bear minute clarity, and the broad strokes that move out of position and back again, in a blurry, smudged or smeared line. But these broad strokes, or “master strokes” are akin to those found in traditional Chinese Ink paintings, carrying much to give an impression of a space. The distinction between the minute clarity and blurry brushwork is what creates the sense of depth, along with the differential choice of colours in the background, and foreground. The range of works seen here are significantly larger than those seen in The Thing It Saw (2008). Arranged in a far larger space than previously seen, the walls here gives each painting enough room to breath and grow. This is a sign that the artist is comfortable with his methodology, but unsatisfied by the arena and edge the smaller canvases play on one’s peripheral vision. The larger canvases are no doubt more substantial, filling the window of the artist’s vision more satisfactorily. And it is only by accepting this invitation to look carefully, one may see these wild, imaginative, playful landscapes of the mind. 39 Keppel Road, #02-04, Tanjong Pagar Distripark, S(089065), http://www.fortunecookieprojects.com. A strange MTV on youtube, Coldplay’s Life in Technicolor. Inserted for the review of Found & Lost. Images courtesy of the artist, all rights reserved. One expects text to accompany video art; the reading of one akin to reading movie spoilers before watching a movie. An image speaks in visual terms, sometimes independent of the written word. Sometimes, the written word is a subterfuge, misleading the viewer. Often, it points like a compass to the magnetic north, and never at true north, suggesting an interpretation of the work but never nearly does it. The image of a sunset probably resides in any photo album, any where else in the world. Every sunset is unique, if one looks hard enough and therefore worthy and not demeaning to attempt one. Any self-respecting camera owning person would have attempted one. Today, any phone camera owner might have attempted one too. The sunset, is like a moment of flirting, a courtship between the sun and moon. The transition from day to night is intriguing, filled with dramatic cloud chase scenes, or the ordinariness of day and night that begets an exciting new tomorrow. The two video pieces The Perfect Desire, and Description of an Image by Cheong Kah Kit for the event of the exhibition Found & Lost, begets the consideration of the universal appeal of image making, and subsequently the poetic gesture of an attempt to deconstruct an image – the signifier, the signified and the signs. The grandeur of a darken projection room allows the private contemplation and conversation of the two pieces, and the sound was decisively omitted. A video diptych, might have been possible, forging new narrative. As challenging as Matthew Ngui’s Chair, we are given a mirror to observe ourselves, finding the perfect desire to snap the most extraordinary photograph out of the most banal; finding the right words to describe the roles images and words play in our understanding of the world, only to realise they are a different sense and cognition altogether. A timely photography exhibition that features a range of works, presented mostly as photo installations, coincides with the Month of Photography Asia, in its 7th year. The works are promising, though not exactly “fusion of themes Transport and Asia…a delightful array of works documenting the history of transportation” (extracted from e-invite). Instead, they represent the artists’ engagement with the medium of photography, with notions of travelling and memory, challenging traditional means of presentation (as static framed pictures), and representation (real vs manipulated). Photography as a discipline is well represented in the various modes of presentations and concepts. Stephen Shore, in his pictorial book The Nature of Photographs, which captures a certain range of visual styles that are sympathetic towards the snapshot aesthetics says that “Photography is inherently an analytical discipline. Where a painter starts with a blank canvas and builds a picture, a photographer starts with the messiness of the world and selects a picture”. The exhibition is loosely divided into four sub-themes: Time, Space, Action and Fiction. These four themes are visual markers, more than a conceptual understanding or statement what photography as a craft or discipline entails. One may understand that all photographs are those captured by devices involving a shutter speed, and in the process flattens a three dimensional space into a two dimensional image. That is a re-presentation of what the lens sees, what the lens is unbiased of. While photography as a manipulative medium is gaining its legitimacy as fine art, it still straddles our polemic perception of it as “given truth”, often cited in the case of Journalism, and “contrived artifice”, often cited by examples from the predominant use of digital manipulations. In the hands of a good photographer, any photograph is biased towards the vision of that photographer, composing, omitting or including elements subjectively. 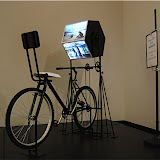 The work by Tung Mai, Racing Forward, features a self pedalled bicycle with a rotating slide hexagonal box, with unnerving digitally superimposed images of Vietnam and those of Singapore. Partially surreal, the work is not realised to its potential, when it loses its interactivity, and constantly shadowed by the “Under Maintenance” sign. It loses its enigma, where the slow pedalling action is suppose to remind the viewer of the rapid pace of progress in Southeast Asian countries, and the need to slow down to even witness the changes. Chun Kai Qun’s Carmegeddon, draws strong continuation and development from his earlier work stereoscopic slidemaster, seen in For Mr. and Mrs. Children. Tapping on his fantasies of a huge construction site converted into a monster car crash and destruction site. The scaled model is then meticulously re-photographed, and converted into a stereoscopic slideshow seen on a Sony PSP. The Asian model cars crashed and burnt in American Hollywood fashion, and felt like a reminder of the current economic crisis. Like British artists Jake and Dinos Chapman, the artist has managed to capture the imagination of terror, miniaturize it, and making it a game. Video games, often cited to train hand-eye coordination and reflexes. On another level, it could be a caution of an overdose of violence in video games in teenagers and young adults, and their inherent anti-social, societal side-effects. Perhaps by nullifying terror, it gives us the courage to look at the scale of the damage, the crashed and the burnt. Mintio’s Conveyance, installation of dazzling multiple exposure prints of light trails are alluring, drawing one’s vision into it’s depth. The black curtains, and surrounding trestles fortify the exclusivity of the experience of viewing, and adds a theatrical edge to the work. The light trails remind me of The Street Hawk (1985), or Star Trek light warp speeds into deeper space. Light trails, created by slow shutter speeds, compresses time into a single frame, unlike PAL video, that stretches 1 second into 25 frames. What is interesting in these digital collages, is the consistent layering of images, just as now time is layered in the slow shuttered image. Jun Nguyen-Hatsushiba’s Breathing is Free 12 756.3, is as conceptual as Richard Long’s Walks. But unlike Long that presents documentation of his intervention set against nature, Jun’s work is fixated on an image of a lone runner, against a plethora of blurred urban landscapes, or motorways. The notion of the Myth of the Artist, which suggests that what the artist makes will be art, is called to play. Featuring interlaced, digitally slow-motioned video, they show evidence of the artist challenging his physical limits. Ironically, the cost of staging leg breaking runs around the world, would cost more than free. John Clang’s work is a scaled version last seen in Clang: A White Book. A good example of how a piece of work could be re-presented to suit the site. Ko Aung’s Human, featuring an installation of black and white panels, and greyed black and white carpet, accompanying photographs of a man and woman, painted/dressed in black and white. The exercise in strict non-colour – black and white – does what it did display, raise question marks. Nge Lay experimental, simplistic Me and Another Process series of photographs, tackles ones’ imagination. The aesthetics of which, when stretched, reminds one of a flame. Richard Streitmatter-Tran’s The Jungle Book, is hilarious, deliberately confusing the audience, with his titles and imagery. A large fish is held hostage, in Gulliver’s Travels Lilliput fashion, and a large space ship crashes into the local canal. The parody of Jonathan Swift’s Gulliver’s Travels, itself a parody of traveller tales literature, is a reminder of the fiction of photography, held hostage by its maker. Gilles Massot’s, The Space within Space within the Space, is largely collaborative with students from LASALLE college of the arts where he teaches photography. The images or clusters of them are pictorially strong, but one cannot help feel congested. 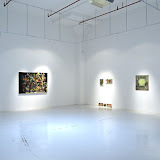 The over crowding, and juxtaposition of different exhibiting strategies, such as the projected compass directions on the floor, to the suspended acrylic dry-mounted transparencies remind one of the real landscape in Singapore, and the religious event which the pictures document: they are highly juxtaposed and laden with meaning, transposing an alter-reality into reality. Road signs, when seen in a particular sequence, surreptitiously gain a new lease of iconic meaning. Dominic Khoo’s Emotion in Transportation series could best be understood and appreciated as street photography. Shannon Castelman’s Jugaads of Southeast Asia transforms the ubiquitous street hawkers’ stalls into objects of fascination, incredibly enchanting visual studies of two bicycles, and tricycles. The rich colours draw the viewers in. Captured by dusk, and without human presence, we are left to ponder their trade, cargo and stories. Mark R. Kaufmann’s The Fabulous Flights of Fancy Time Machine, is a splendid contraption that is strategically sited next to Shannon Castelman’s work. An assemblage of everyday objects, and a giant toy of a boy’s fantasy, an idealised realisation of childhood. The lighting adds to the lure and imagination of a real flying object, but not in the Da Vinci aesthetics. One suspects the work was more ambitiously interactive. The “low carbon (emission) flip book cinema” does not quite work with the context of the installation, and one leaves expecting more. In Cinema Paradiso fashion, it celebrates film, and all its magical moments. Chua Chye Teck’s April 2008, Tokyo transgresses the theme of transportation badly. Instead, it picks up the subtle colour of pantone pinks, diluting in scale from left to right. Minimalistic in presentation, and highly methodical in production by On Kawara standards, it distills the colours of the Japanese flag (Red and White), and suggests the dilution of culture and traditions. The inevitable, perhaps in an evolution, and Art or photography as a medium, a record, internationally recognised standard of Culture. Xavi Comas’ Pasajero/ Passenger, fulfills the fantasy of every traveller that carries a camera. Consisting of some ill placed fluorescent light tubes and selected digital prints, the work mimics a traveller’s photograph slide show, projected on a wall. The role of the flaneur, or observer is often the privilege role of artists on society. A foreigner in Japan, he observes the habits and sights on the Japanese commuting trains, giving a narrative to each frame filled. Traditional Black and White here, is timeless, it distills and simplifies these narratives. What is perhaps annoying to the pre-digital viewer is the lack of the grain, the texture of traditional photography replaced by digital pixels and white burns. The TransportAsian exhibition, given the title, was not as kitsch as one feared. These sets of contemporary fine art photography, as opposed to commercial photography has served to establish the creative potential of the craft to set one smiling or thinking. Perhaps photography as its best, travels at the speed of memory. Like Roland Barthe’s musing over the significance and appeal of photography in his book Camera Lucida, the draw of photography begins with those images that mean most dear to us. 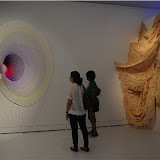 The works in the exhibition are diverse in their engagement with the artists’ unique interests, choice of materials, and presentation, yet coherent in the choice of works and theme of the exhibition. Similar in their questioning of what constitutes the visible and invisible, ‘ways of seeing’, and the pervasive use of ‘the line’. 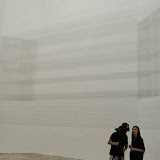 The artists independently explore a story line, a line ‘mapped’ by the body in space, scribbled lines drawing from memory, an almost invisible line by white letrasets on a white wall, a wall of threadlines suspended in mid-air. Contextually speaking, the works resonate strongly, and would bode well with an adventurous art audience. Placed in the context of a commercial gallery, it marks a generous, and bold move to support the artists in Singapore. The work by Khiew Huey Chian is site specific, spanning the width of walls, creating a visual spectacle of two floating, ‘apostrophe’ marks, cast in the air. Yet made of thread, strung precariously on nails from one end to the next, they represent the artists’ largest thread gallery installation to date. The lines glisters as one shifts while still looking at it, as if looking for a rainbow. Always interested in something temporal, transient and light-handed, it follows the minimalist traditions of simplicity in presentation, and more conceptual in approach. The break through works by Ian Woo are simply stunning, resembling a hybrid of organic muscles and crystal lattices; objects that float in the middle of large paper surfaces. Employing various monochrome values possible with the pencil, these are acted out, almost exploding onto itself. Unlike his earlier abstract acrylic paintings, these clusters are without a landscape or context, residing instead in our understanding of his processes of mark-making, possessing both clarity and obscurity; of minute details in each pencil stroke, yet devoid of apparent real representation. The video of a lone man swimming and in the act, clearing a path of algae in an abandoned swimming pool by Charles Lim is possesses European aesthetics, yet universally poetic. The art is caught in that singular act, caught between the reflection of the monitor and the swimmer trapped in the screen. We are left transfixed wanting to see what happens, except to find that the path clearing continues, and we too start drifting in consciousness. The work is better regarded as a video installation than a record of a performance. Metaphorically, we can guess that it could represent a catharsis by both the viewer and performer to clean and glean, or an intervention that disrupts the logical, an entry point into our subconscious understanding of one’s interpretation of the act. Resembling an excerpt from a dream, the viewer is left to fill in the gaps, pondering and swimming in ambiguity. The video pieces and light drawing by Erika Tan is incredibly social, and perhaps a metaphor for the construct of a collective memory of Mount Fuji. Layered, and incredibly simple, line drawn over and over again, the boundaries shifts and our vision blurs. Sookoon Ang’s unusual ‘Horse’, made of helium alphabet-shaped balloons and cast iron numbers 1 to 6, is a playful take on one’s association of meaning and that of written language. A Kantian approach with phenomenology might leave us further baffled. How we try to understand the work is split between the word ‘horse’ formed by light helium balloons and the heavy cast iron numbers which they are tied to. The visual irony might be an easier way to approach the work, in the traditions of Surrealist Rene Magritte and his visual juxtapositions. Matthew Ngui’s re-presentation of his seminar work, Chair (2008) is refreshing. The work is literally deconstructed, left in transport crates, and flanked by a video and photographs. Its significance to Singapore conceptual art, and its persistence to question perspectival vision remains unchallenged. Shubigi Rao’s work borders on invisibility, creating passages of text using white letraset on a white wall. What is left on display, are both the text, and the letraset sheets which the letters came from, revealing the clue for the viewer t look harder, or rather impossibly at the text. The metaphor here could perhaps be the need to fill in the gaps with our imagination, based on the title of the work, just as how the ‘seeing’ is never complete, under the kind of lighting and setting. Found & Lost, does challenge the act of observation and introspection of the viewer. Seen in the correct spirit and light, it allows one to see lines – from maps, double yellow lines, carpet patterns – before losing attention, more clearly than before. One keeps ‘finding and losing’ artful situations in other instances. The lightness of the exhibition, bordering on the visible and invisible is equally intriguing, challenging one’s perfect 6/6 vision or augmented vision, both of the physical world, and one’s openness and inclusion of what is not necessarily there, but essential to appreciating and accepting contemporary art. 8.0 of 10 stars. The exhibition accompanies the book Aversions, a drawing publication project (S$50, from Osage Gallery whilst stocks lasts Errata: $40 during Found & Lost exhibition period, and thereafter $55). Another side note, the works do not reproduce well on photograph, just like how a drawing with its graphite sheen always looks better on paper, than a reproduction. Aversions, to some, may be confusing if they regard it as a catalogue. It is not. It does not necessarily follow the works of all the artists, nor does it describe or explain the works in the exhibition. If one follows the written work of the curator, Guo Liang, the text lies between a kind of expository descriptive essay and fiction-writing. Here, Drawing is almost treated like a character in a story, and his past, present and future revealed. The works are not mere illustrations to the text, but actually as important as paragraphs themselves; Aversions is thus a book that ‘flips’ between the literal and visual, attempting to draw another side of process as art to our attention. 1. The action of turning away oneself, one’s eyes, etc. b. Const. (towards, against, obs. ), from, to (for), inf. A blaze in the right direction, and a daring display of works by graduates from the Masters, Degree, and Diploma programmes in the same gallery.